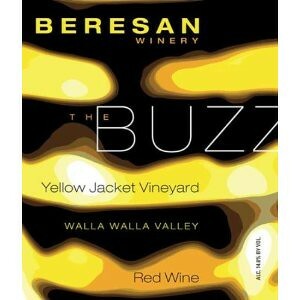 This intriguing blend of Viognier, Roussanne, Marsanne and Semillon comes from a trio of excellent Walla Walla vineyards. Fresh grapefruit, pineapple and peach notes swirl together, framed by light almond. I’m no fan of this grape, from Washington or anywhere, but once in awhile a really good one comes along, few better than this. A tight spine of fresh herb leads through a dry, tannic red with dried berry flavors and espresso livening up the finish. Maturing pomegranate and cherry fruit flavors combine in this elegant wine. Firm acidity underpins its deep veins of fruit, and it finishes with a gentle hint of mocha and caramel. This outstanding 100% Malbec is sourced from the Pepper Bridge and Stone Valley vineyards. Details and highlights of tobacco and herb add interest to the mix of berry, cherry and plum fruits. This blend of Cabernet Sauvignon, Syrah, Merlot and Cabernet Franc ties together fruit from the estate vineyards, noted for their cobblestones. Firm and Bordeaux-like (allowing for the addition of Syrah), it has a classic structure of black fruits, along with lightly-applied flavors of dried herb and wood, earth and coffee. It would be difficult to find another blend this good from the sub-region known as the Rocks for less than $30. Cabernet Sauvignon, Cab Franc, Merlot, Malbec and Syrah combine into a deeply-flavored wine with blue and black fruits, licorice and a streak of delicious caramel. Grab this one by the case.